I ended up liking these way more than I ever thought I would. They were probably the easiest sloppy joe I have ever made. I loved that besides salt and pepper, I didn't have to add any spices or chop up any onions or peppers, because, thanks to the salsa, it is already in there. I used my favorite, go-to, Homemade Salsa that I had already made to use in another dish and I added that to the hamburger along with a little brown sugar and canned tomato soup. Don't let the canned tomato soup scare you away. It doesn't end up tasting like you added tomato soup, it just adds a little tomato flavor that all sloppy joes have and it helps it be thick and saucy. I served these with a side of Baked Garlic Parmesan Fries and I loved it all. 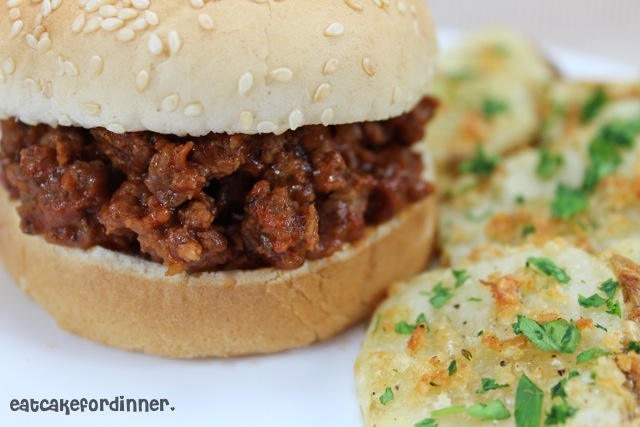 If your family enjoys sloppy joes - I bet they will love this version! Try it. Brown meat in a skillet over medium heat; season with salt and pepper. Add the salsa, condensed soup and brown sugar. Stir well to combine. Simmer for 10 minutes. Serve on hamburger buns. Jenn's Notes: These were so good. I used ground beef and homemade salsa and they were done in no time! Sounds good! I have to try them! what a great easy meal for back to school!